Yellowstone National Park was struck by 'a swarm' of 153 mini earthquakes last month, according to the latest data from the University of Utah Seismograph Station. The largest of these quakes recorded a magnitude of 2.5 on the Richter magnitude scale, which is not enough to cause damage to buildings, but shakes the ground enough to be felt by people in the area. Below the Yellowstone National Park is a simmering supervolcano. When it last blew 630,000 years ago, the enormous volcano produced one of the largest known blasts on Earth – spewing more than 2,000 times as much ash as Mount St Helens did when it erupted in 1980 and killed 57 people. However, experts have said the latest sequence of earthquakes recorded in the Yellowstone area is not an immediate cause for concern. According to data from the University of Utah Seismograph Station, which analyses the Yellowstone Seismic Network, the largest quake struck on July 4 2018 at 7:09 PM local time. It was part of a sequence of 12 separate earthquakes located around eight miles east southeast of West Thumb in Wyoming that occurred between 2 - 10 July. 'A larger sequence of 77 earthquakes occurred around 14 miles south-southwest of Mammoth, Wyoming, during July 16–27', researchers wrote. 'The largest earthquake of this swarm was a micro earthquake of magnitude 2.3 on July 24 at 8:40 PM'. Experts say that earthquake sequences such as this are common and account for around 50 per cent of the total seismic activity in the Yellowstone region. 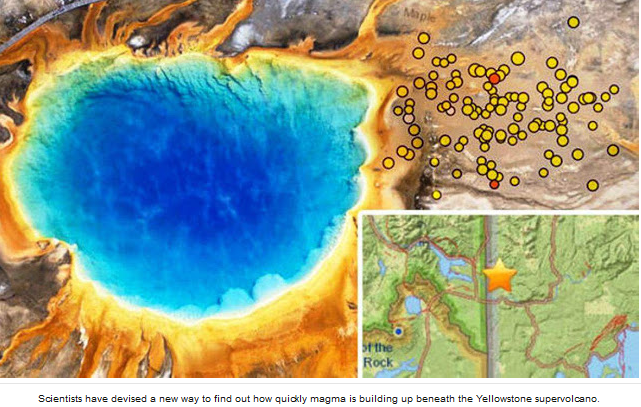 'Yellowstone earthquake activity remains at background levels,' researchers wrote. Yellowstone Volcano Observatory scientists are also continuing to assist colleagues in Hawaiʻi with the response to the ongoing crisis at Kīlauea Volcano. Vast eruptions from the Yellowstone Volcano occurred 2.2 million, 1.3 million and 630,000 years ago. While it hasn't blown its top for more than 600,000 years, scientists are working to better understand Yellowstone in the hopes of predicting the next eruption. Last month, a fissure opened up in Grand Tenton National Park just 60 miles (100km) from the Yellowstone volcano, prompting officials to immediately close the area. Experts detected expanding cracks in the rock buttress, which were being closely monitored by geologists for movement. 'The Hidden Falls and Inspiration Point areas are currently closed due to elevated potential for rockfall,' the statement from a spokesperson for the Grand Teton National Park in Wyoming read. The Hidden Falls is 100-foot (30-metre) waterfall near the eastern end of Cascade Canyon and Inspiration Point is a stop on a trek overlooking Jenny Lake. 'The area was closed to protect human safety on July 10 after expanding cracks in a rock buttress were detected. In June, it was revealed scientists have devised a new way to find out how quickly magma is building up beneath the Yellowstone supervolcano. The technique allows experts to accurately estimate the amount of magma entering the supervolcano from deep beneath Earth's crust in a process known as recharging. While the new method does not allow scientists to predict when Yellowstone will erupt, it could help to better understand how the volcano replenishes its deadly magma stores.